The only way to experience adventure is to dive right into it -- and that's exactly what you can do with this guided tour of the reefs of Kauai! 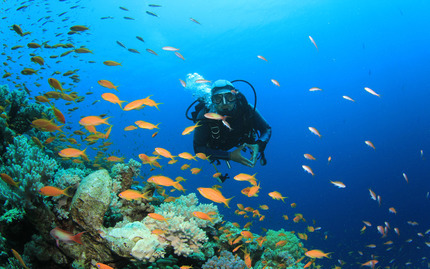 To make sure that you can focus on the fun instead of freaking out, you'll begin your tour with a comprehensive scuba lesson designed to make even absolute beginners comfortable. You'll receive on-land instruction from an experienced professional, and practice in contained water to make sure you've got the hang of things. Then, you'll move on to an open-water dive in the crystal clear waters of Kauai where you'll be treated to absolutely gorgeous, up-close views of teeming aquatic life just waiting to be your new friends. Note: This tour is for a maximum of 4 people. All gear is included. In the "Special Requests" section, please indicate height, weight, and shoe size for each person in your group. Cancellation notice must be provided at least 5 days in advance in order to receive a full refund.